She's an actor, director and choreographer all rolled into one. An actor, director and choreographer all rolled into one, Sunny Bringhurst has been intertwined with The Off Broadway Theatre for about eight years and involved in musical theater for years before that. On the production side, her latest endeavor is directing and choreographing Forever Dead, which runs through Nov. 4 with shows at 7:30 p.m. every Friday, Saturday and Monday at 272 S. Main. It's a parody of the popular jukebox musical Forever Plaid, loosely based on that show. It's featuring, instead of the regular quartet, the universal movie monsters: the werewolf, the Dracula, the mummy and Frankenstein's monster. We parody songs from the musical Forever Plaid, so anyone who has seen that will recognize the numbers, particularly in the first act of the show. 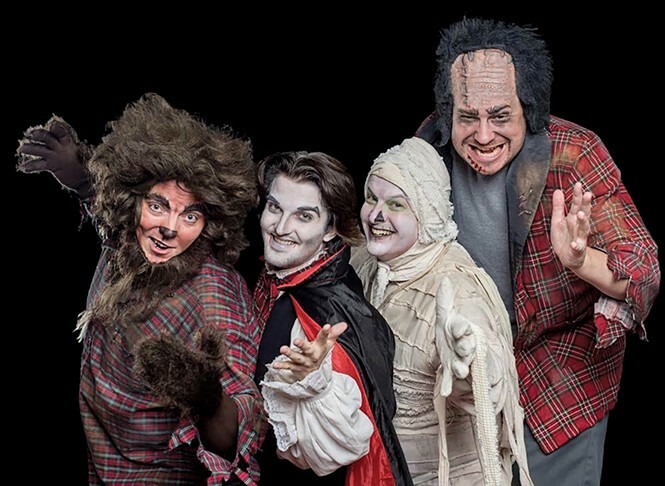 Whereas the characters from Forever Plaid come back from the dead to do their last show, this one has our universal monsters figure out what they need to do to be able to pass on to the next realm and not have to continue haunting The Off Broadway Theatre. Through the music and through the numbers they figure out what they need to resolve into the next life. It is. It was written by Eric Jensen. He's the artistic director of the OBT. John Baty has added a number of jokes and songs to bring it current. He's kind of an audience favorite. He's been with the OBT since it's been around. Why do you think it connects with local audiences? Since the show is open to improv, every audience gets a show that is just for them. We have lots of Utah-centric jokes and current pop culture, politics and news—not that it's political at all—but there are moments that audiences will recognize from current events. ... There are little audience participation opportunities, and our final departure song is actually kind of made up on the spot for that particular audience for that particular night. ... It builds that Halloween excitement for kids and adults. It's a musical show, and it's packed full of singing and dancing and music. It's a cast of four actors plus the accompanist who pops in as an ancillary actor herself, but there's only four, and they're on stage from top to bottom. There's no scene changes, no breaks, really. It was a tremendous amount of work to learn all these songs, which have pretty intricate four-part harmonies, fully choreographed, as well as the scripted lines, and being able to speak on their feet for the improvisation. ... We've got four incredibly talented guys that worked really, really hard and were super dedicated to get all of that done in a regular amount of rehearsal time, which for us is three days a week. For a regular show, you'd rehearse six days a week to get it all done. What's next for me is I'm having a baby in a couple of weeks. So, I'll be taking a little break. We did this whole thing in my third trimester of pregnancy. But I will be choreographing and directing H.M.S. Pinafore for The Off Broadway Theatre next year.